Chateau / Country House3750 sq. ft.
We do not rent to graduation parties. Everyone staying at Lake Naomi Retreat must be 25 years of age or staying with their legal guardian. "Lake Naomi Retreat", your Pocono Mountain get away, provides peace and tranquility in a wooded setting with something for everyone. It is the perfect choice for entertaining with a large deck, screen porch, full kitchen with granite counter tops and stainless appliances, 3 large screen television, three full bathrooms and five comfortable bedrooms. With many nearby ski ares (Jack Frost, Big Boulder, Camelback, Shawnee, and Blue Mountain),the Mt. Airy Casino, Water parks (Kalahari, Great Wolf, Camelback, Aquatopia, Splitrock), Pocono Raceway, outlet shopping and much more all within 20 minutes, your vacation is not limited to the summer months! Your vacation mountain home is located within the Lake Naomi Club private lake community with the main beach and an Olympic size heated pool, fishing streams, fitness center, tennis courts, golf course, and a gorgeous new community center with indoor pool, basketball courts, tennis, game room, ice rink and more. Lake Naomi is rated as a one of the premiere communities in the entire country. It has the largest heated outdoor swimming pool in Pennsylvania, with a high diving board, kiddie pool and huge water slide that drops you out about 5 feet above the water! All of this is set on one of the most stunning lakes you have ever seen. In addition there is a huge tennis complex, seven beaches with boat rentals, sailing lessons and more. This community is the "Hamptons" of the Poconos. If the weather is not cooperating, there is a large community center with an indoor pool, gym, tennis courts and gymnasium. You’ll have access to all of Lake Naomi’s amenities by purchasing an optional Lake Naomi Club temporary membership. To get an idea of the pricing for the temporary membership, you can call the Lake Naomi Admin office at 570-646-9191. The temporary membership and the additional fee that goes along with the membership is not required to rent the house; it is only required if you want to take advantage of Lake Naomi’s amenities. With all there is to offer, a Pocono Mountain vacation is the perfect choice this year! We are family of 5. We love Lake Naomi and all the wonderful activities for our whole family. We chose Lake Naomi Club because of all the offerings it has for our 3 kids. It is also very close to 3 ski areas, a nascar track, waterparks, white water rafting, and outlet shopping. garage is used for ping pong table and sail boat storage in winter. Living room is open to kitchen and dinning room with large screen tv and blue ray player. Stainless steel refrigerator in kitchen and small beer and wine fridge under counter. Large Peninsula with Granite counter tops, stainless steel appliances, wine fridge. We have 1 large dinning table that can seat in excess of 10. The pool table can also be converted into a dining table with 4 wooden leaves and will seat 14. Armoire full of board games. 8 foot pool table with no obstructions. Table top included so table can convert for dining. Pleasant experience for all ages. Thanks so much, a large group can really spread out in the many different spaces the house offers! Wonderful house in the perfect location for skiing. The house was clean and even better than advertised. The owner David replied quickly to every question before we arrived. Our family of 14 was comfortable and enjoyed the home and skiing close by. Would not hesitate to recommend this home. Thanks so much for the nice review of our vacation home. We love Lake Naomi Retreat and feel lucky that we can share it with other families. Bealtiful house. Smooth rental process. Will definitely stay again. We stayed at Lake Naomi Retreat for our annual Corn Day reunion trip. We had 4 couples and 6 children from 4m to 6yrs. The house was perfect in every way! It had comfortable beds, nice furnishings and (4!) bathrooms. There was plenty of space for the kids to play (backyard, game room etc) a well appointed kitchen, a pool table and a spacious great room. Lots of comfortable seating for all of us inside and outside. Plus a fire pit with plenty of firewood supplied! Basically everything we could ask for in a rental property. The kids had a blast being outside in the well maintained yard. We brought a telescope and were able to see Jupiter and its moons on one clear night. The local beach was clean and the water was a nice shallow entry - perfect for small children. The house was close to stores and attractions but still felt secluded and serene. Thanks so much - we hope to be back next year! So glad you enjoyed it, we look forward to having you back. This Winter was the second time we stayed at the Lake Naomi Retreat which says a lot because we NEVER stay in the same house twice, but we enjoy this house so much that we’ve changed our house hopping ways!!! The house was great last year, but the upgrades this year made it even more fabulous! We love the open floor plan and ample bedrooms. We have 12 in our group and it never feels crowded. The dining room table is perfect for family dinner or game night! The two living rooms provide lots of space for family to relax and socialize comfortably. We also love how close the house is to sking and snow-tubing, as well as to the Crossings Outlets! The house was a lot bigger and more spacious than I anticipated. The pictures do the house no justice. The house is great and offers the right essentials for a short getaway. I went with 12 close friends for a weekend and we had a great time. Close to Poconos Nascar Raceway, Mount Airy Lodge, Camel Back water park and ski area, Split rock indoor water park and ski area, Jack Frost Ski Area, Outlet mall, Antiques Mall, White Water Rafter and tubing, various golf courses, Kalahari indoor water park and convention center. Year Round Rentals, with 2 seasons. 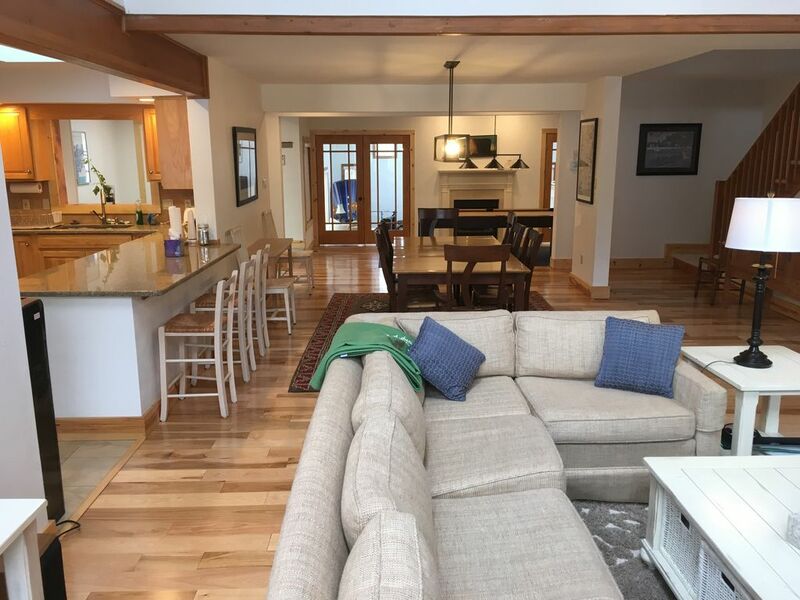 Summer season; 1 week rentals Saturday to Saturday June through September $2,500.00 Winter season; Weekend rentals Friday to Sunday September through June $475.00 per night standard rate (minimum 2 nights). Refundable Security Deposit $500.00 Cleaning Fee $150 Temporary Membership Fees for access to Lake Naomi Club amenities: June 25 through Sept 5 (Main Season): Approx $275 per family/per week subject to change by the Lake Naomi Club.